Life is full of pressure for all of us. Every role that we play has its own unique set of pressures. These pressures often force us to feel like we have to “fake till we make it”. We don't know what to do, so we feel pressure to hurry up and do something before people figure out that we don't know what to do. In our culture doing something wrong is more forgivable that admitting that we don't know what to do. We value doing something, even if it is totally wrong, over doing nothing. In college I got the privilege of meeting a guy who owned and bred champion labs. Not like pretty dog show champion labs, but like the hunting and retrieving competition labs. These dogs could run, jump, and hunt. This caused me to get in to watching these competitions for a while. Every dog in the competition was impressive. They could all run fast and jump far. But the most impressive dogs were the ones that could resist their urge to run out after a target, and wait for their owners to give them the word to go. Scripture says that in the believer's culture, there is value in waiting. 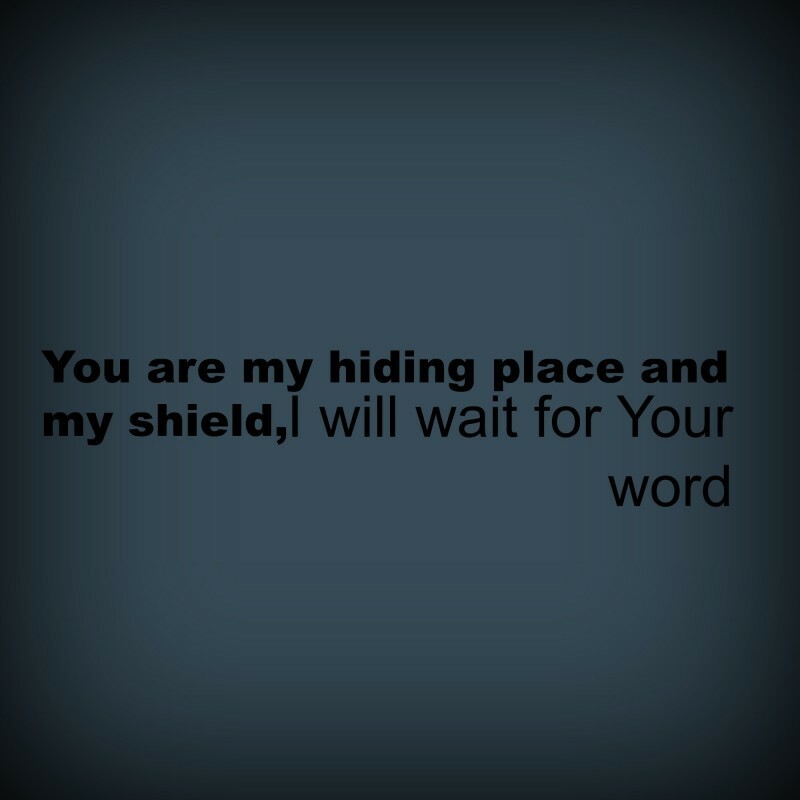 Psalm 119:114 says You are my hiding place and my shield, I will wait on your word. In fact, in four different places Psalm 119 says I will wait on your word. All throughout scripture we are told the value of waiting on the Lord, or waiting to hear from Him. In all of the areas of my life where I feel pressure to know what to say or do or be, what I need most is to hear from the Lord. I need to know what He who searches the hearts of man knows. I need to know what He who imagined the universe thinks. I need to hear from God. Today I am more convinced that my biggest mistakes are not knowing what God wants me to do and refusing to do it. My biggest mistakes come from not knowing what God wants me to do and refusing to wait and listen. I need to hear from the Lord. There is a lot of pressure that comes from being a pastor. The pressure to meet the expectations of a congregation full of people that all have slightly different expectations. The pressure to always know the right thing to say. The pressure to always be in the right place at the right time. The pressure to remember who wants you to make a big deal out of their birthday, and who wants you to not even mention it. The pressure to not get those two lists mixed up. The pressure to pick up on the subtle cues that something isn't quite right with those that feel they should be strong and not bother the pastor. The pressure to make sure each sermon and event is bigger and better and more creative than the last, or else all your members will abandon you for the church down the street. There is a lot of pressure in being a husband. The pressure to know the right compliment to give your wife about her outfit. The pressure to use the right tone of voice so that she knows you mean it and don't just feel obligated. The pressure to know when she needs you to fix things and stand up for her, and when she just needs you to listen and not get involved. The pressure to remember where this rarely used item goes in this weeks version of reorganizing the house. The pressure to lead her and love her like Christ. There is a lot of pressure in being a father. The pressure to love and build up your kids. The pressure to not love and build up your kids so much that they become rude and intolerable. The pressure to balance the urge to mold them into who they need to be while letting them discover who God made them to be. The pressure that comes from feeling like everyone around you has an opinion about whither or not you are disciplining your children to the proper degree. In college I got the privilege of meeting a guy who owned and breed champion labs. Not like pretty dog show champion labs, but like the hunting and retrieving competition labs. These dogs could run, jump, and hunt. This caused me to get in to watching these competitions for a while. Every dog in the competition was impressive. They could all run fast and jump far. But the most impressive dogs were the ones that could resist their urge to run out after a target, and wait for their owners to give the the word to go. Scripture says that in the believer's culture, there is value in waiting. The verse that caught my heart today was Psalm 119:114, You are my hiding place and my shield, I will wait on your word. In fact, in four different places Psalm 119 says I will wait on your word. All throughout scripture we are told the value of waiting on the Lord, or waiting to hear from Him. Today I started a week long prayer journey through Psalm 119 as well as other scriptures. I thought it might be appropriate to blog through my journey. Writing it out for myself and sharing it with the world. This morning, my heart got hung up on several verses. Some because they challenged me. Some because I know I fail at them. Some because I was thankful for what God has done in my life. The second I began to pray through this verse, God shocked my heart. I suddenly realized that He has given me everything I ever asked for. God has surely dealt bountifully with me. There I was, in a room with other men, weeping over God's word. Weeping over the fact that He has dealt bountifully with His servant. Weeping over how much God has blessed me. I realized something bowed there this morning. 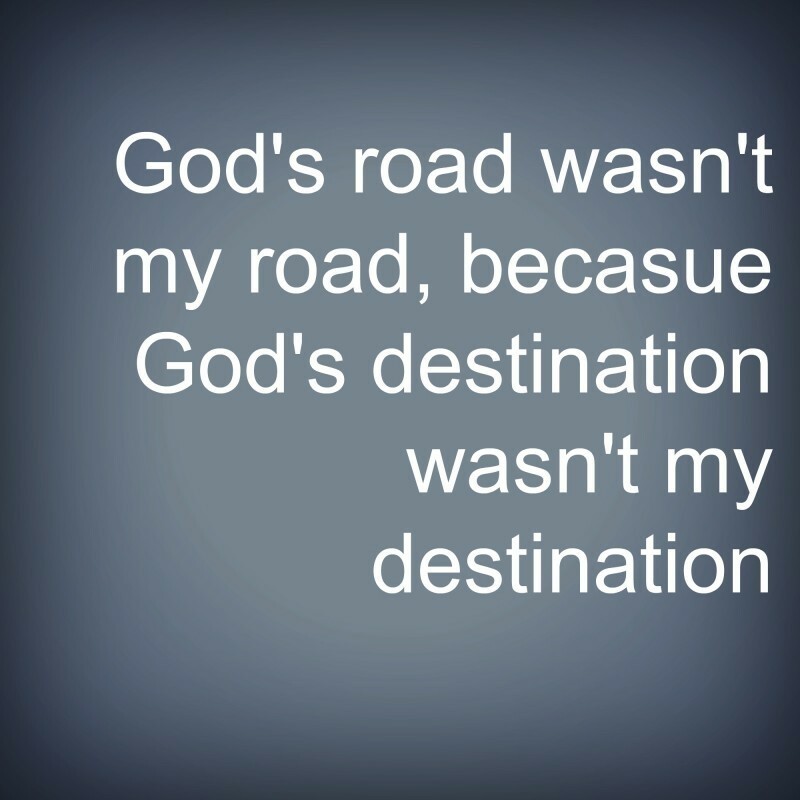 God's road isn't my road, because God's destination wasn't my destination. I would have taken a different road through life. That is something that I know God knew. There have been many times in my life that I have looked around and told God: “We must be on the wrong road, because I don't recognize any of my surroundings right now.” Many things on the road were not where they were supposed to be on the road through life. Marriage, house, kids, car, career, friends, and many other things weren't in the right spot on the road I was traveling. Even though it wasn't the road I would have chosen, God has dealt bountifully with me. He has given me a job that I love. When we moved into our house I told my dad I was embarrassed because I never thought I would live in a house this nice. I have a wife who is wonderful. I prayed that I would someday have girls, and now I am the father of two amazing little girls. God has given me everything I have ever asked. The road wasn't the road I would have chosen, but the scenery sure is wonderful. Mother's Day is a wonderful, complicated, happy, tortuous holiday. It is a wonderful thing to think about and remember our Mother's. But, it falls right between Easter, graduations, summer plans, end of school, ball games, spring cleaning and a dozen other things. It is weird that a we put a holiday that we made up and picked a date for in such a complicated place on our calendars. It is happy to think back and reminisce about all the fun times we've had with our moms. But, there are also those out there that are struggling with the loss of a mother. Or there are those out there struggling with not being a mother yet. With all of that in mind, here are three specific mother's to pray for this year. Mom 1: Mother's without moms. It is a hard thing to lose a loved one. But, there is something especially hard about losing your mother. Who do you go to with questions, with heartache, with complaints, with celebrations, with you name it? For most of us, it is our mom, and when you lose her you lose a part of your compass in life. Please pray for Mom's without moms as that fact is highlighted today. Mom 2: Mother's without focus. Being a mom is a hard task. Motherhood is glamorized as a life fulfilling and wonderful journey. But, the truth is that the day to day task of being a mom is like a vortex that traps you in a mess. Messes that nobody made. Stuff in places that you cannot identify or figure out how it got there. Attitudes that seem like they will never get adjusted. The day to day vortex of motherhood can make you lose focus on both the goal you are headed toward and the progress you've made. Please pray for mom's who are struggling to stay focused today. Mom 3: Mother's without children. Women seem to have so much pressure placed on them to have children. Some of it comes from within, and some of it come from outside sources. Sources like parents, friends, church members, culture. The pain of not having kids comes in various stages and for various reasons. But, the pain is real. It always brings up a question:“How can someone desire something so much, and God not giving them the desires of their heart?” That question leads to doubting self, doubting God, and doubting life. Please pray for Mother's without children on this day that highlights their deepest pain in life. They are hurting in ways that you may never know, see, or understand. But, their struggle is real and important to our church. In the church world, we make a big deal about being called to ministry. We should make a big deal about someone being called into the ministry. But, we must realize that pastor and missionary are not the only two ministries to which God is calling His people. God is calling all of His people to ministries everywhere. God is calling you to a ministry where He wants you to invest your life. That brings up two questions: What kind of Ministry is God calling you to? What should my Ministry look like? To answer these and other questions, we will tackle the Who, What, When, Where, Why, and How of being called to ministry. This week we start with the Who. The Who can be the most important question to ask. It is probably the one that we get wrong most often. The obvious first answer is You. God is calling you to a ministry. But, that is not the Who that should be at the center of your ministry. At no point is God ever calling us to put ourselves at the center of our focus. When we feel God calling us to a ministry, it often revolves around a Who or a What. Perhaps our biggest mistake is that we place the circumstances around our calling to ministry at the center of our call to ministry. Many young people have felt God move on their heart while in the youth ministry or on a mission trip. This may prompt them to surrender to being a youth pastor or a missionary someday. While this may be God's plan for their adult life; why is He calling them to something they cannot yet do and what does He expect them to do in the mean time. Some adults feel God move on their hearts while working with VBS. This may lead them to the conclusion that God is calling them to a children's ministry. While this may be true, what if there is not a next step for them to take in children's ministry at that time? The “Who” that we are ministering to when we feel God move on our hearts may or may not be the Who that God has in mind for our ministry. They are certainly not the Who that belongs at the center of our ministry. I have seen many people, youth and adults alike, identify a clear calling from God on their hearts only to abandon it later because they had the wrong Who at the center of their ministry calling. So, who is the Who that belongs at the center of our ministry? The answer is the same for all of us: The Who is Jesus. Any ministry that doesn't have Jesus at the center is not a ministry of God. When Jesus is the focus of your ministry, it opens doors and brings flexibility to something that we often think of as very narrow and unchanging. We often want to place the who we are ministering to in the Who spot of our ministry, but it is the who we are ministering for that belongs there. When Jesus is the Who of your ministry, the who you minister to can change daily, weekly, or with seasons of life. It may sound like the Sunday School answer, but Jesus must be the center of your ministry. The Who will be the foundation that your ministry on which your ministry is built. Jesus moves on our hearts when we participate in His work. We cannot mistake the circumstances around our calling for our calling. Our calling is to Him who is stirring our hearts. Our calling is to His will. Our calling is to glorify Him with our life. Our call to ministry is a call to pour our life into Jesus.